Uses DawnBringer's 16 colour palette. How do you figure low res is limiting? A better fit for lower resolutions and can be scaled up for higher resolutions. Very nicely done! As a programmer it's always difficult to find very high quality resources like this. I'd love to see more! Is it... "Skunny Save Our Pizzas" perchance? 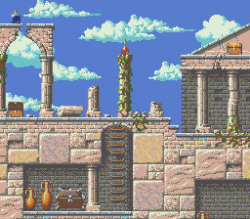 i can not take my eyes off this tileset. It's such a beauty like an amiga tile. I've to use it somewhere. Great professional work! edit: I've used this one on a logo for my own (soon to be online) website. Hi I don't understand the licence terms. If I use this in a free game do I lose control of the source code? +1 for CC-BY. My games may be commercial, and I avoid CC-BY-SA because it's impossible to get a simple answer of "can I use this without releasing ALL my source code?" It would be better to ask the artist to clarify whether he is okay with his art being used without the entire source code being released. Note that the general consensus is that it's okay to use CC-BY-SA art without releasing source code (and that's my own understanding of the license now), but I'm not aware that a lawyer has ever weighed in on it, and I'm not one myself. All that being said, I'd encourage you to respect the artist's wishes about it, even if you're not contractually bound to do so. @surt: What's your take on this? That's the thing, though - how do I document/prove that the artist gave permission? How do I include that in the credits of the game? How do I prove it if someone disputes me? And I have to do it for each piece of art, each artist. It's just easier for me to avoid CC-BY-SA and stick with CC-BY - it's cleaner-cut, I can include the attribution in my credits, and be done. And I don't have to worry about making a mistake and using something I'm not supposed to. Of course, it means some very excellent art remains out of my reach. BTW, I have been working on pixel art recently, and am planning on submitting some art here once I get things finished/organized. If surt answers you, you have it in writing, which means that you have documented proof. You could save the web page if you're concerned (and yes, that can be faked, but then so can a license file, so it's no different from a standard license in that respect). I know surt, and he wouldn't pull that kind of thing on anyone. Furthermore, while license compliance and copyright enforcement are entirely the responsibility of the users and the artists respectively, if asked, I'll always do my best to provide evidence of what really happened, and that includes going through old backups if comments or art have been deleted (although in the years this site has been around, I've never been aware of any licensing disputes going that far). Regardless, clarifications in writing that grant additional rights over the original license legally supersede the license, so if surt says you have permission to use his art without releasing your code, then you have legal standing to do so. Anyway, OGA's stance on licensing is that it's entirely up to the artist, so it's not my place as the guy who runs this site to ask surt to do anything other than clarify his intentions (and he doesn't have to do that if he doesn't want to, although I don't see why he'd have a problem). Oh, I'm sure surt is a plenty nice guy, and I'm not too worried about a dispute. This website is proof enough, and you offering to go through backups is MORE than helpful and friendly. I just reread your original response, and saw this line for the first time: "the general consensus is that it's okay to use CC-BY-SA art without releasing source code." That's AWESOME!! I mean, I'm not opposed to open-source in general, or open-sourcing some of my code in the future, but it's just not something I'm prepared to do at the moment. If I ever use any CC-BY-SA art in any project, I would of course re-submit any alterations back here at OGA. I made a sort of lite version of this and thought I'd share it. 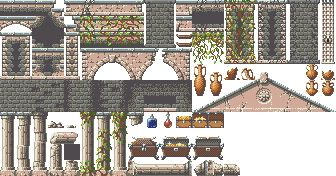 I used Metroid Zero Misison style negative space, allowing the main tiles to be much more compact, and added a few more variations of different tiles, like a longer horizontal pillar, some more stuff with plants and cracks, and a few different pots. Also added an iron gate that has a lock.